Having the right equipment for the right fish. Having the right equipment for the right fish is everything . Some will say yes the other no . But when you are fishing , having the right equipment will do many things . First of all , if you are going to get those monster fish in lakes or river , you need to be prepare physically , mentally and have the right equipment to catch the fish without hurting the fish and yourself . Going to get big Musky or Lake Sturgeon need a very strong rod with strong line . For this if you don't want to spend a lot of money you can go with what i got . It's a Shimano TDR 8 feet long Medium-Strong action 20 lbs test rod with a Shimano Corvalus 400 baitcasting reel with 40 lbs test braided line . Total retail we're about 125$ . If you want to go smaller on the catch but you still want a respectable size Northern Pike or Bass and shoot with accuracy. Then go with a smaller baitcasting rod and reel . Those rods and reels can do the trick . The top one is a Abu Garcia Vengeance rod with a Daiwa Megaforce Twitching reel . This rod is very strong and sensitive for it's size but i use most offen for Pikes . The bottom one is a Abu Garcia Veritas rod and a Pflueger Echelon reel . This rod configuration is for Bass . The Veritas is extremely sensitive and i sense the smallest touch trough the rod . On both those rod i use braided line . The trick is to bring those two along and set two diffenrent lure . So that way you are always prepare for anything that might show up :) Each of those rods configuration cost about 120$ each . The Echelon has an amazing 6 ball bearing system for only 84$ ! For those looking for good old Walleyes or Rainbow Trouts , i suggest getting a lightweight short rod and a good spinning reel . Again let's not go over budget on this . This set-up is a Fennwick Eagle GT lightweight rod with a Pflueger President 10 bearing Spinning Reel . I have this set-up since this summer and the result is something . You can use it for Bass if you want a really good fight , but the main use is for Walleye and Rainbow Trout . The rod cost only 45$ and the reel (the best part) only 65$ ! 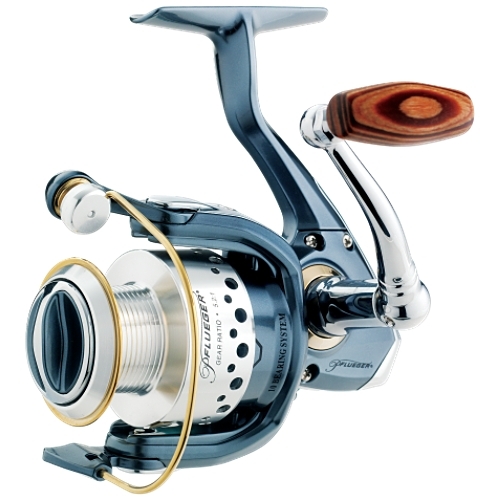 65$ for a 10 ball bearing reel is an incredible price ( Got it at Canadian Tire store) The rod is made in part of Carbon Fiber so it's very strong . Last but not least , the tackle box. There's a lot of different tackle box , in size and in style . Keep in mind that the perfect tackle box is the one you NEED . This one on the picture is my personal tackle box . It's a big one ! I chose this one because of the removable compartment below . When i'm going fishing on the shore of a river , i'm putting those compartment in my backpack to have all i need and still have mobility . If you are looking to go fishing today , don't forget that having the right equipment for the fish your are looking for is important not just for the fish but for you as well . So i wish to all of you a GREAT FISHING DAY !